DFPC is seeking applicants for Battalion Chief (Battalion 21-NW District) position. In this position, one of the Wildland Fire Management Section's (WFMS) primary roles is to assist and support local agencies with a range of wildland fire management programs including administrative, technical, preparedness, planning, response, and prescribed fire functions. The position will assist with other WFMS programs, and may be assigned other duties to support the mission of DFPC. For more information, click the link provided. 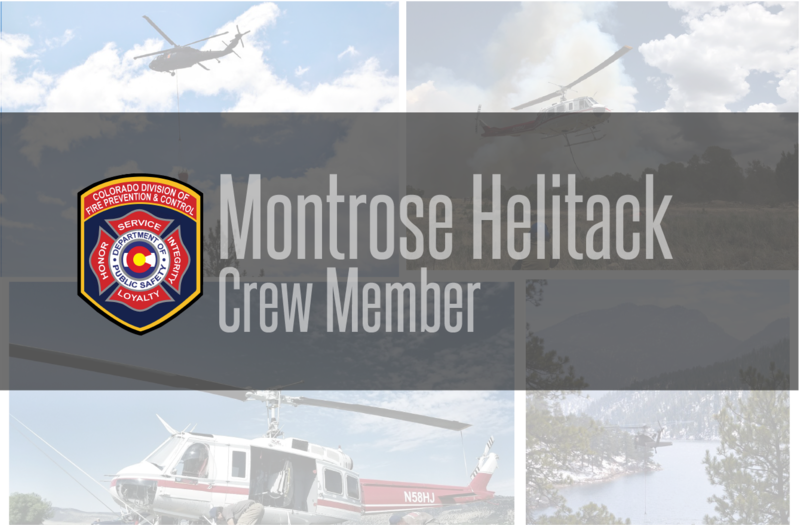 Montrose Helitack Crew Member (Temporary Aide) Position REPOST! The Colorado Division of Fire Prevention and Control is currently seeking applicants for the 2019 wildland fire season.This position is for a Helicopter Crew Member position. DFPC resources primarily operate within Colorado, but may be sent to other states if needed. Employees will also have the opportunity to work on hand crews, engines and other resources if desired and needed. Resources and employees may be assigned away from the home base location for extended periods to meet the needs of the State.